I had no idea. Gelato. Did you know? Robin and James tried to make it clear to me, and Max, Alex, and Maria confirmed it... that Gelato Gaia is the step above and beyond ice cream. It is sumptuous taste goodness. But until we went out to celebrate Egg Drop Day, and the awesomeness of Box of Noodles and Bounce Missile, I had no idea. I sampled the Belgian chocolate, and no surprise, it was super yummy. But I resolved to refrain. Most of my life I've confronted frozen treats with the utterance... "Nah. It's too cold (hot, late, early, bright, dark) for ice cream." Then Geoff gave me a taste of pistachio and all of my defenses fell, shattered. You guys! Pistachio gelato. Gaia Gelato! This discovery is the end of my blog. I have to quit writing and photography to take up running, and aerobics, and also get a real, paying job. Ok, maybe that's a bit desperate, but for sure this was a game changer in my relationship with frozen desserts! You're not good for my diet - I'll swear I've put on 2 lbs just looking at that photo! 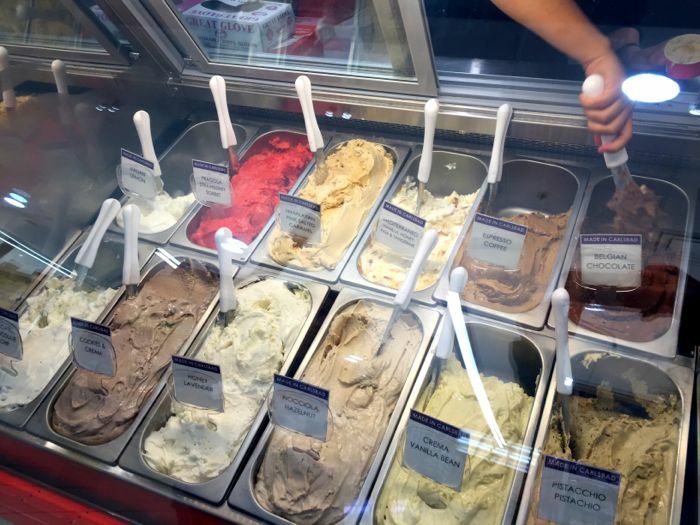 I'm going to starve myself until the summer and then live on gelato - it looks amazing. It all looks good, but on that recommendation, I'll have the pistachio. You MUST try the Chocolate hazelnut one. It is AMAZING!